← Buck Rogers Reborn ! 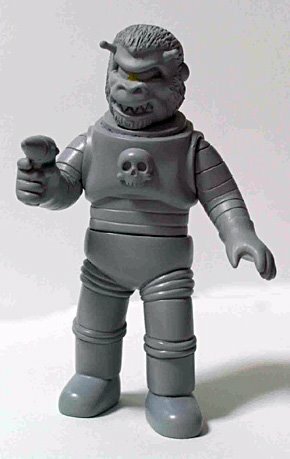 Coming very soon, this new head for the Space Troopers series from Japanese toy makers Toygraph. I was aksed to design a new head for their clever series of figures that have that 1950’s Mars Attacks feel 😉 … I decided to go the Ape route knowing full well the fondness the Japanese have for them , especially in human suits ( ha-ha ) anyways my sketch here was masterfully turned into the prototype shown above. the figures stand about 5 inches tall…. actually a nice size to collect. Oh and I had to come up with a name … so it’s Mizaru-1 … Mizaru is the See No Evil, Speak No Evil, Hear No Evil monkey which is from Buddhist roots , I believe …anyhow, why the dash one ? well I figured that would be more Sci Fi-ish ?